FAMILIES are feeling the pinch more than ever right now. In many cases they are facing rising household costs but declining income and – very soon – thousands will also be hit by reductions in benefits. As a Council we have been working hard to do as much as possible to try and reduce the impact of this for people. We’ve come up with a local Council Tax discount scheme which is designed to protect the most vulnerable whilst investing in job creation – long term planning that is much-needed in Oldham if we are to turn our economy around. We are now also looking at what we can do in other areas to help free up money and cushion your household income. The Get Me Toasty campaign to install energy-saving measures in homes free of charge has got off to a great start, saving real money for many local people. A few weeks ago we then also launched a new campaign to try and reduce the cost of public transport, as outlined recently on this blog by Councillor Sean Fielding. Now we have launched another money-saving campaign for you – but from a very different angle. 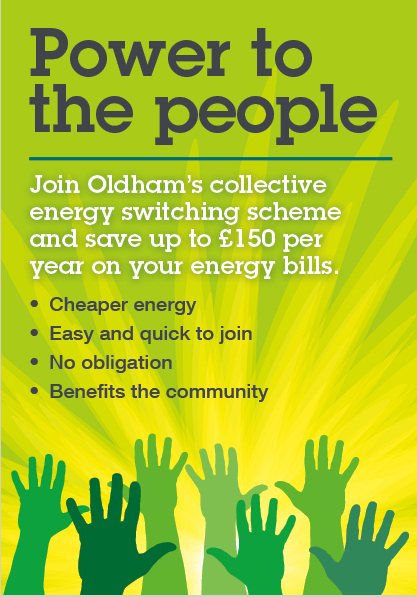 Whereas those other schemes are about Oldham Council doing things for you, it is now time to do things with you in the form of our new Energy Co-operative. By pulling together people in this Borough would have huge potential buying power as a group. Almost 100,000 households spend many millions of pounds each year on the things we can’t do without – but it doesn’t mean we can’t do it for less money. Oldham Council has got together with Ichoosr, a specialist in the collective buying of energy who have already run very successful schemes in the Netherlands and Belgium. The idea is simple. If you want to come together as a Borough and form a buying cooperative we will assist by taking this bulk contract to the energy companies and asking them to bid for the work in an auction. The lowest price offered will get the contract – and you will get the saving. On average we expect each household to save around £150 a year which, when added to our energy saving programme Get Me Toasty, means up to £500 a year back into your pocket. Please visit the Oldham Council website now to register your interest. Have a look at http://www.oldham.gov.uk/info/200706/fuel_co-operative for more information and note that you are under absolutely no obligation to switch suppliers. I must close this week by saying a massive well done to everyone involved in Oldham winning the ‘Best City’ category in Britain in Bloom 2012. This is an absolutely huge prize for our Borough and also great recognition that when the Council works closely with the local community and businesses, the end product can be truly remarkable. I must, obviously, also highlight the work of our parks team who are a real jewel in our Civic crown and work extremely hard day in, day out. Ours is a beautiful Borough, although not every neighbourhood has a stunning Pennine view. When we met the RHS judges earlier in the year we told them why this competition was so important to Oldham. But we see an award like this as another significant part of the work we are doing to attract inward investment. We need recognition like this nationally to help change the perception of our borough. Inevitably there will be some people who will ask why Oldham Council is funding projects like this at a time when it says it has no money (indeed, some already have on Twitter in some very choice language!). My answer to that is simple. To attract investment we need to make Oldham a place where people want to live and work – not one where people feel they have no choice but to be. We need to showcase Oldham and prove that we invest in our Borough in order to convince others that the place is a sound investment. Ultimately, if we are serious about creating the conditions for growth and attracting investment, we have to up our game. A major national award like this shows we’re making good progress, but there is no room for complacency and still plenty to do. “FAMILIES are feeling the pinch more than ever right now. Why then are Oldham doing a FTB deposit scheme? The reason why people are feeling the pinch and their income is declining is because we had a housing bubble and larger mortgages take up too much of their disposable income. Why do Oldham Council (and other councils) want that to continue? By trying to enable some FTB to buy what they cannot really afford, it means everyone else has to pay bubble prices. Then going forward people will still be feeling the pinch. We need cheaper living costs in order for people to have more disposable income. THis would also help struggling high streets, if banks were extracting less income from the economy.